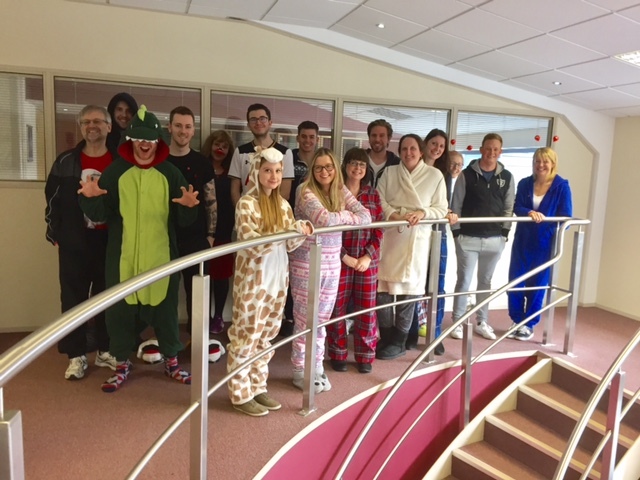 Never one to miss an opportunity to raise some money for charity, the Classic Folios team turned up to work in their pyjamas for Red Nose Day. From dinosaur onesies to red pug t-shirts, the team dressed up, well down, for the occasion, paying a £1 to do so. As well as everyone donned in their pj’s, everyone was encouraged to bring in their best bakes, decorated red to match the theme of Comic Relief. Alison, former Classic Folios Bake Off winner and Senior Customer Services Manager, won the cake competition with a lovely Victoria sponge with cherries on top, whilst Lorna, our Junior Editorial Assistant received the best dressed prize for her giraffe onesie. In total, Classic Folios raised £104.32, which contributed to the grand total of £71million raised by Comic Relief, a record amount since the charity was founded in 1985 by Lenny Henry and Richard Curtis to help fight poverty. Classic Folios will continue to fundraise across the year in a bid to support worthy causes throughout 2017.